Added sugar is the single worst ingredient in the modern diet. It can have harmful effects on metabolism and contribute to all sorts of diseases. Here are 10 disturbing reasons why you should avoid added sugar like the plague. 1. Added Sugar Contains No Essential Nutrients and is Bad For Your Teeth You’ve probably heard this a million times before… but it’s worth repeating. Added sugars (like sucrose and high fructose corn syrup) contain a whole bunch of calories with NO essential nutrients. For this reason, they are called “empty” calories. There are no proteins, essential fats, vitamins or minerals in sugar… just pure energy. When people eat up to 10-20% of calories as sugar (or more), this can become a major problem and contribute to nutrient deficiencies. Sugar is also very bad for the teeth, because it provides easily digestible energy for the bad bacteria in the mouth . Bottom Line: Sugar contains a lot of calories, with no essential nutrients. It also causes tooth decay by feeding the harmful bacteria in the mouth. 2. Added Sugar is High in Fructose, Which Can Overload Your Liver In order to understand what is so bad about sugar, then you need to understand what it is made of. Before sugar enters the bloodstream from the digestive tract, it is broken down into two simple sugars… glucose and fructose. Glucose is found in every living cell on the planet. If we don’t get it from the diet, our bodies produce it. Fructose is different. Our bodies do not produce it in any significant amount and there is no physiological need for it. The thing with fructose is that it can only be metabolized by the liver in any significant amounts. This is not a problem if we eat a little bit (such as from fruit) or we just finished an exercise session. In this case, the fructose will be turned into glycogen and stored in the liver until we need it. However, if the liver is full of glycogen (much more common), eating a lot of fructose overloads the liver, forcing it to turn the fructose into fat. When repeatedly eating large amounts of sugar, this process can lead to fatty liver and all sorts of serious problems. Keep in mind that all of this does NOT apply to fruit. It is almost impossible to overeat fructose by eating fruit. There is also massive individual variability here. People who are healthy and active can tolerate more sugar than people who are inactive and eat a Western, high-carb, high-calorie diet. Bottom Line: For people who are inactive and eat a Western diet, large amounts of fructose from added sugars get turned into fat in the liver. 3. Overloading The Liver With Fructose Can Cause Non-Alcoholic Fatty Liver Disease When fructose get turned into fat in the liver, it is shipped out as VLDL cholesterol particles. However, not all of the fat gets out, some of it can lodge in the liver. This can lead to Non-Alcoholic Fatty Liver Disease (NAFLD), a growing problem in Western countries that is strongly associated with metabolic diseases. Studies show that individuals with fatty liver consume up to 2-3 times as much fructose as the average person. Bottom Line: Excess fructose gets turned into fat, which can lodge in the liver and cause non-alcoholic fatty liver disease. Insulin is a very important hormone in the body. It allows glucose (blood sugar) to enter cells from the bloodstream and tells the cells to start burning glucose instead of fat. Having too much glucose in the blood is highly toxic and one of the reasons for complications of diabetes, like blindness. One feature of the metabolic dysfunction that is caused by the Western diet, is that insulin stops working as it should. The cells become “resistant” to it. This is also known as insulin resistance, which is believed to be a leading driver of many diseases… including metabolic syndrome, obesity, cardiovascular disease and especially type II diabetes . Many studies show that sugar consumption is associated with insulin resistance, especially when it is consumed in large amounts . Bottom Line: When people eat a lot of sugar, it can cause resistance to the hormone insulin, which can contribute to many diseases. 5. The Insulin Resistance Can Progress to Type II Diabetes When our cells become resistant to the effects of insulin, the beta cells in our pancreas make more of it. This is crucial, because chronically elevated blood sugars can cause severe harm. Eventually, as insulin resistance becomes progressively worse, the pancreas can’t keep up with the demand of producing enough insulin to keep blood sugar levels down. At this point, blood sugar levels skyrocket and a diagnosis of type II diabetes is made. Given that sugar can cause insulin resistance, it is not surprising to see that people who drink sugar-sweetened beverages have up to an 83% higher risk of Type II diabetes . Bottom Line: Because of the harmful effects of sugar on the function of insulin, it is a leading driver of type II diabetes. Cancer is one of the leading causes of death worldwide and is characterized by uncontrolled growth and multiplication of cells. Insulin is one of the key hormones in regulating this sort of growth. For this reason, many scientists believe that having constantly elevated insulin levels (a consequence of sugar consumption) can contribute to cancer . In addition, the metabolic problems associated with sugar consumption are a known driver of inflammation, another potential cause of cancer . Multiple studies show that people who eat a lot of sugar are at a much higher risk of getting cancer . Bottom Line: There is considerable evidence that sugar, due to its harmful effects on metabolism, can contribute to cancer. 7. Due to its Effects on Hormones and the Brain, Sugar has Unique Fat-Promoting Effects Not all calories are created equal. Different foods can have different effects on our brains and the hormones that control food intake . Studies show that fructose doesn’t have the same kind of effect on satiety as glucose. In one study, people drank either a fructose-sweetened drink or a glucose-sweetened drink. Afterwards, the fructose drinkers had much less activity in the satiety centers of the brain and felt hungrier . There is also a study where fructose didn’t lower the hunger hormone ghrelin nearly as much as glucose did .Over time, because the calories from sugar aren’t as fulfilling, this can translate into an increased calorie intake. Bottom Line: Fructose doesn’t cause satiety in the brain or lower the hunger hormone ghrelin nearly as much as glucose. 8. Because it Causes Massive Dopamine Release in The Brain, Sugar is Highly Addictive Sugar can be addictive for a lot of people. Like abusive drugs, sugar causes a release of dopamine in the reward center of the brain . The problem with sugar and many junk foods is that they can cause massive dopamine release… much more than we were ever exposed to from foods found in nature . For this reason, people who have a susceptibility to addiction can become strongly addicted to sugar and other junk foods . The “everything in moderation” message may be a bad idea for people who areaddicted to junk food… because the only thing that works for true addiction is abstinence. 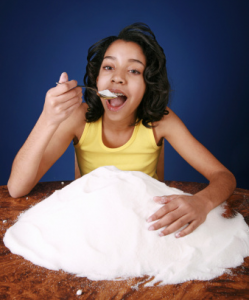 Bottom Line: Because sugar causes a large release of dopamine in the brain, it can cause addiction in a lot of people. 9. Sugar is a Leading Contributor to Obesity in Both Children and Adults The way sugar affects hormones and the brain is a recipe for fat gain disaster. It leads to decreased satiety… and can get people addicted so that they lose control over their consumption. Not surprisingly, people who consume the most sugar are by far the most likely to become overweight or obese. This applies to all age groups. Many studies have examined the link between sugar consumption and obesity and found a strong statistical association . The link is especially strong in children, where each daily serving of sugar-sweetened beverages is associated with a whopping 60% increased risk of obesity . One of the most important things you can do if you need to lose weight is to significantly cut back on sugar consumption. Bottom Line: Because of the effects of sugar on hormones and the brain, sugar dramatically increases the risk of becoming overweight or obese. 10. It Ain’t The Fat… It’s SUGAR That Raises Your Cholesterol and Gives You Heart Disease For many decades, people have blamed saturated fat for heart disease… which is the #1 killer in the world. However… new studies are showing that saturated fat is harmless . The evidence is mounting that sugar, NOT fat, may be one of the leading drivers of heart disease via the harmful effects of fructose on metabolism . Studies show that large amounts of fructose can raise triglycerides, small, dense LDL and oxidized LDL (very, very bad), raise blood glucose and insulin levels and increase abdominal obesity… in as little as 10 weeks . These are all major risk factors for heart disease.